What are some of the best ways to enhance the compassionate practice of medicine? How do you make sure the culture of an institution values caring? This is the third in a series of interviews with the three winners of the 2017 DeWitt C. Baldwin, Jr. Award. We previously highlighted Montana Family Medicine’s and Vanderbilt University Medical Center’s accomplishments in humanistic care. By highlighting practices for teaching and implementing compassionate, collaborative, and scientifically excellent practice, we hope to share and facilitate widespread adoption of replicable humanistic education and practice. The Baldwin Awar d is jointly sponsored by the Arnold P. Gold Foundation and the Accreditation Council for Graduate Medical Education (ACGME), and named for Dr. Bud Baldwin, a pioneer in inter-professional education and collaborative practice. 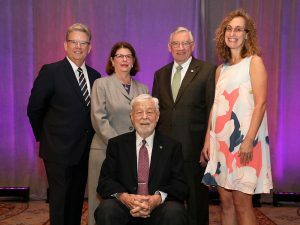 The award recognizes accredited residency and fellowship sponsors that foster supportive and humanistic environments for medical education and patient care, contributing to the personal and professional development of learners. “Receiving this award is a celebration of what we do really well, which is train physicians for the future not only in their science and clinical skills, but also in retaining their humanistic side, in working well with teams and in becoming professionals who are committed to serving their community,” said Stephanie Ann Call, MD, interim associate dean for graduate medical education at Virginia Commonwealth University School of Medicine. Call joined Deborah Davis, CEO of VCU Hospitals and Clinics at VCU Health System, to receive the award on behalf of VCU and VCU Health at the 2017 ACGME Annual Education Conference in Orlando, Florida on March 10.